The Hastinapur regional unit of the Asom Jatiyatabadi Yuva Chatra Parishad (AJYCP) on Friday staged protest in the premises of the office of the Assam Power Distribution Private Limited (APDCL) at Pathsala in Barpeta district demanding regular supply of electricity. 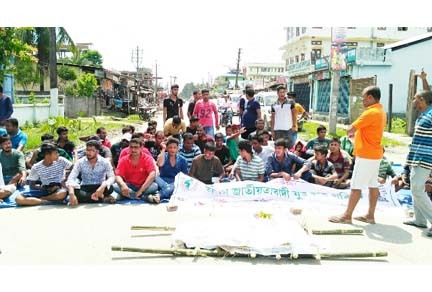 The AJYCP activists took out a symbolic funeral procession and submitted a memorandum to the chief executive engineer of Barpeta Division of APDCL and urged the authority to improve the supply of electricity, especially from the Rupahi feeder. It may be mentioned that the people of the area have been suffering a lot since long due to irregular supply of electricity. The activists also alleged that a section of APDCL workers engaged in the area are not regular in their duties resulting in irregular power supply in the area. “Due to long hours of load-shedding, the day-to-day activities in the area are also getting hampered. Due to scorching heat, the people of the area are frequently falling sick and due to irregular power supply, the electric fans have failed to bring any relief. The worst sufferers are children, infants and the elderly people. Besides, non-supply of regular electricity has caused huge losses to the business community,” said the protestors. The protestors also demanded that the Rupahi feeder be divided and the Hastinapur, Puthimari, Singimari, Udalguri, Sialmari and Hakartup areas be connected with a new feeder line so that the people of the area may get regular supply of electricity. They also demanded replacement of the 11,000 volt cable, which they claimed, has become too old. They further demanded that the control room telephone number should remain active for 24 hours. Lohit Das, chief executive officer, assured the agitators in writing that arrangements would be made for additional 10 MW of power through the Barnagar feeder from July 25 and distribute the additional power equally among all the feeders.